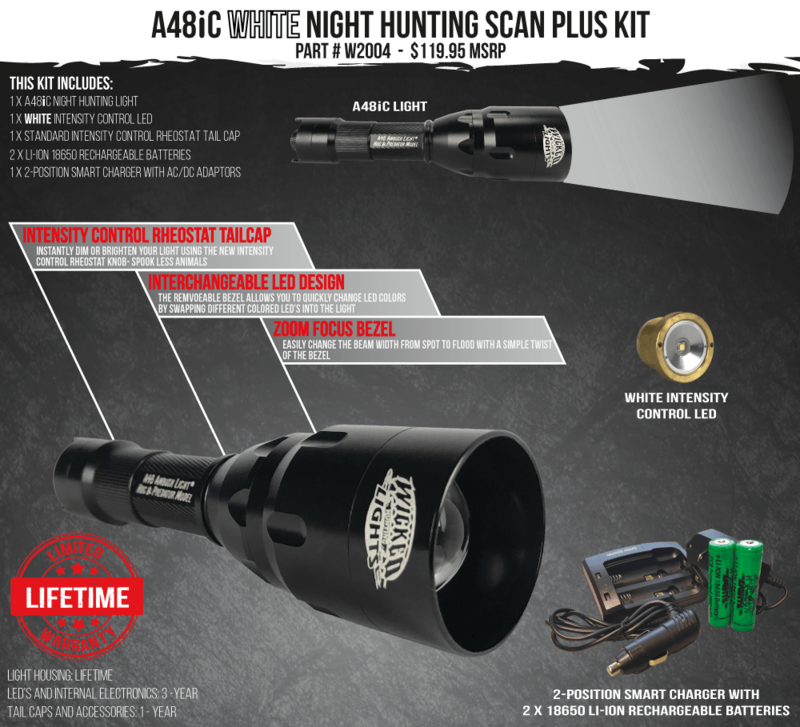 Wicked Hunting Lights™ is excited to announce the addition of the A48iC Ambush Hunting Light with Intensity Control and Scan & Kill® Technology. Successfully target hogs, coyotes, fox, bobcat, raccoon and varmints at night with the Wicked Hunting Lights™ A48iC Ambush Hog & Predator Hunting Night Hunting Light. The A48 is purpose designed & built specifically for night hunting. Warranty: Limited Lifetime on light assembly. LED assembly three years. Battery and charger one year. See manual for details and limitations. The A48iC Intensity Control LED features a 3-year warranty, and can be changed in the field in less than 20 seconds for those wishing to use or experiment with a diffident led color. *Approx battery life using high quality, fully charged, Wicked Lights 18650 3.7 Li-Ion 2600ma battery. Note: Battery quality varies widely between brands and ma ratings are often grossly exaggerated on cheap batteries. Well-made and very bright! Worked as advertised and then some.